The Year of Astronomy was celebrated in 2009 to commemorate the 400th anniversary of Galileo’s invention of the telescope. 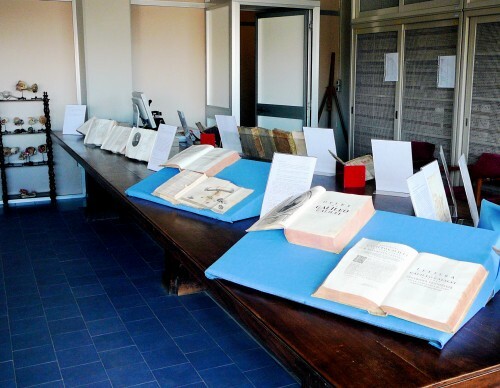 It was also a special opportunity to see the Florence Biomedical Library and its collection of first edition books published by the scientist, including the volume that brought him before the Inquisition. The Biblioteca Biomedica is located in the Careggi Hospital complex. Galileo’s books came to the library from the collection stored at the ancient (built in 1288, but still in use) Santa Maria Nuova Hospital, located near the Duomo. It was a bit disconcerting to realize that over a million dollars worth of books and manuscripts were on such casual (though securely locked) display. The oldest book I saw was the Operazioni del compasso. Written in Galileo’s workshop in Padua and printed in Bologna in 1609. Only 60 copies were printed. (One was just sold at auction for over $500,000.) 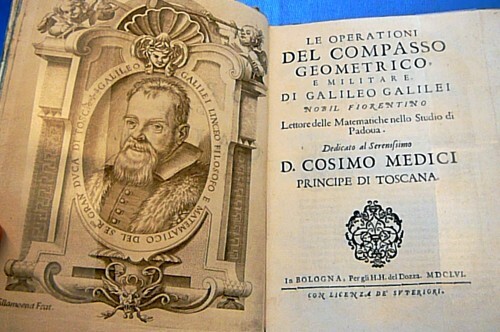 Galileo may have issued the Operazioni del compasso in order to establish his sole priority as the inventor of the “geometrical and military compass,” a calculating and observation device that he had begun manufacturing in 1597. It was a mathematical device – a sort of calculating ruler based on the principle of proportional magnitudes – that brought speed and accuracy to computations about armaments and their trajectories. Galileo’s compass remained unsurpassed until the advent of the slide rule in the mid-nineteenth century. His pamphlet is the first published work on an analogue calculator. The success and popularity of Galileo’s instrument naturally made it attractive to imitators, and Galileo deliberately omitted any illustration of the compass in his treatise as a deterrent to unauthorized copying. 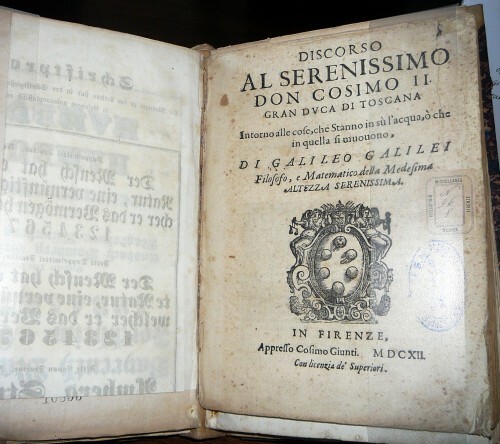 Galileo’s important (and unendingly titled) treatise on hydrostatics, Discorso al serenissimo Don Cosimo Il Gran Duca di Toscana intorno alle cose, che stanno in su l’acqua, o che in quella si muovono (“Discourse to the Serene Don Cosimo II, Grand Duke of Tuscany, Concerning the Natation of Bodies Upon, Submersion in, the Water”). Written in 1612, the “Discourse” constituted Galileo’s first direct attack on Aristotelian science. Written in the context of an ongoing dispute on the nature of buoyancy between Galileo and a group of pro-Aristotelian Pisan professors, the Discourse on Bodies in Water represented an attempt by Galileo to transfer the dispute from a narrowly focused to a more general and systematic approach. In it Galileo refuted the Aristotelian view that a solid body’s ability to float is a function of its shape, demonstrating instead the truth of the Archimedean principle that flotation depends on the relative densities of the floating body and the fluid. “DIALOGO”, now known as the Dialogue Concerning the Two Chief World Systems (Dialogo sopra i due massimi sistemi del mondo), written by Galileo in 1632, compared the Copernican system with the traditional Ptolemaic system. In the Copernican system the Earth and other planets orbit the Sun, while in the Ptolemaic system everything in the Universe circles around the Earth. The first edition at the Biomedical Library has a beautiful woodcut frontispiece of Galileo, Copernicus and Ptolomy discussing the universe. This was the book that, in part, led to Galileo’s Inquisition trial and subsequent excommunication by the Pope. 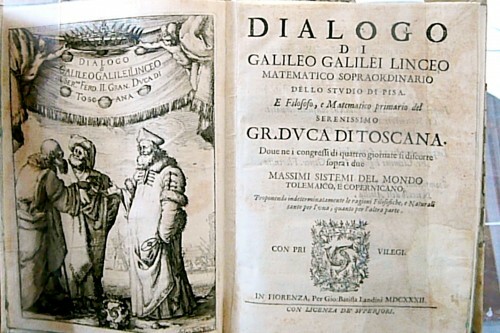 Galileo’s formal use of the term and title Dialogo allowed him to explore his Copernican theories fully within the rubric of the “equal and impartial discussion” required by Pope Urban VIII, thus getting around the initial scrutiny of the Inquisition, which, in fact, granted it a formal license to be printed, believing it to be a book discussing tides, not knowing that the subtitle would reference “two chief world systems”. (The name by which the work is now known is extracted from the subtitle.) The book was dedicated to Galileo’s patron, Ferdinando II de’ Medici, Grand Duke of Tuscany, and was a bestseller. The fact that so many copies went into circulation throughout Europe was its salvation because within a year Galileo was convicted of “grave suspicion of heresy”, and the Dialogo was then placed on the Vatican’s Index of Forbidden Books, from which it was not removed until 1835.